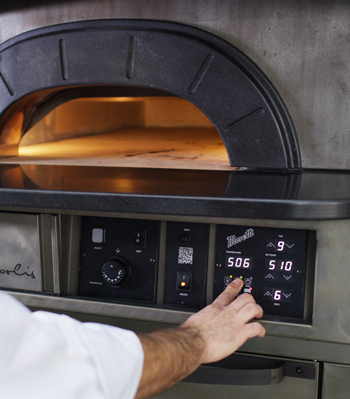 An exceptional baking tool with a cutting-edge design that respects tradition, the wood burning oven turns to electric, a new oven for a great pizza. Moretti Forni have used all of their experience to give you the highest temperature ever seen in an electric oven: 510°C. No one has ever gone so far as Moretti Forni to guarantee you maximum temperatures that allow you to bake a Neapolitan pizza in less than 1 minute. 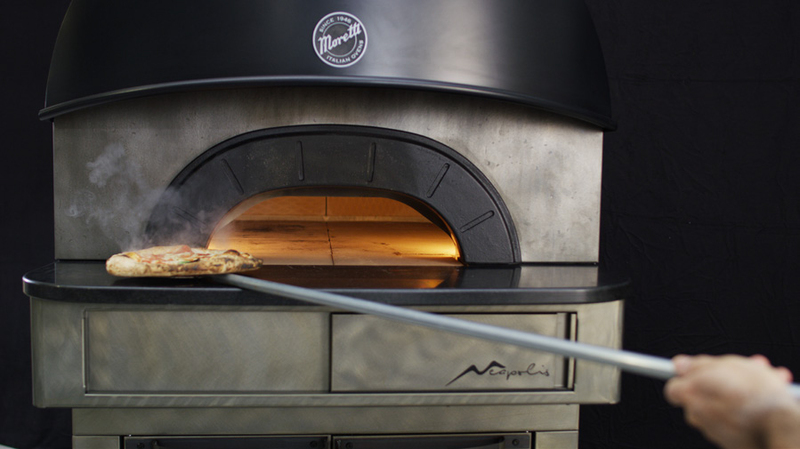 The Neapolis oven embodies the centuries of expertise and manual skills that have made the Neapolitan pizza a world-famous lifestyle and food ambassador. Moretti Forni has studied this tradition to develop a new means that will convey this message of excellence to every corner of the globe. Starting from the heart of the traditional old centre of Naples, where the Neapolitan pizza was born. A complete range of electric and gas ovens expressing the highest level of integration between form and function. Reliability, maximum productivity, high performances. They have used the best materials and applied the most intelligent solutions to limit power consumption and also respect the environment. Neapolis is equipped with an electronic temperature management: the pizza maker set required temperature and keep this setting for all the time needed. The new-generation software of Neapolis guarantees the perfect baking everytime! The software is equipped to manage the installed power of 14.7 kW to achieve the maximum working temperature in just 1 hour and 45 minutes. And also to consume the absolute essential minimum during use: just 6.5 kW/h to bake over 200 pizzas per hour. Neapolis is made of cutting-edge materials that allows an optimal insulation and in spite of the high temperatures; you can touch the external surface without burning yourself. The insulation, vintage stainless steel finishes, an opening in heavy-duty cast iron, black steel hood, baking deck in biscotto di Sorrento clay, and optimised heating elements are all details that explain why Neapolis is an oven that cannot be equalled. Neapolis is ready to bake: once connected to power supply, you just need to switch on the smart display to set different temperature of ceiling and floor. Whether you’re thinking about a traditional pizza, a “chariot wheel” pizza, thin-crust pizza, a “pizza canotto” or a crispy base, Neapolis gives you all the power your pizzeria needs. And it’s up to you to decide how much and for how long. All the pizza you want with perfect results, every time and without stopping. Neapolis is the ideal companion when it comes to making the pizzaiolo’s and baker’s job much easier. Powerful, reliable, and tireless. Power can be controlled from the electronic display, meaning you can set the temperature to your requirements and keep this setting for all the time you need, without any worries. The combination of artisan skills and intelligent control, together with patented blades, means you can keep the ideal moisture setting for your pizza and bake all the pizzas you need without stopping. It also solves the problems of the firewood purchase, storage, and the environmental pollution caused by unburnt gas.